Expression, creativity and imagination were words that the Salem Chamber Orchestra used to describe its "Cirque: An Instrumental Affair" event. This dinner and art auction was surrounded by reminders of the music they were supporting. Guests entered the Grand Ballroom to dancers Lauren Wimmer and Kelsy Richmond, part of Starr Studios. The room was decorated with festive musical centerpieces designed by Jan Stirling, and attendees were wowed by a room full of fabulous art by featured watercolorist Sam Rouslin. The musical group Unbande played in the background. Salem Chamber Orchestra, founded in 1984, is our resident professional orchestra and is in its 26th season. Concerts are held in the Hudson Hall of the Mary Stuart Rogers Music Center at Willamette University. Supporting the Salem Chamber Orchestra runs in families. 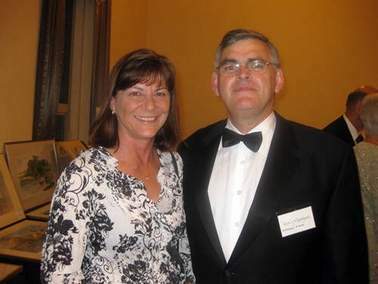 Board Treasurer Chad Campbell attended with his parents, Trudy and Dan. Member of the event planning committee and a board member, Rosemary Wood invited daughter Julie McFarlane from Bend and sister Margaret Doolen from Portland. After browsing the Rouslin collection, which was a mix of impressionism and realism, we took a peek at the auction items, which were instruments transformed into imaginative works of art. As a former woodwind player, I appreciated "Tenlaric," a stylish piece made with a clarinet, created by Salem artist, Kristin Kuhns. If you wanted a cool string instrument to display in your study, "Rio Amazonia Violin" by Salem artist Catherine Natasha Alexander would suit you. Leah and Peter Miller brought them around the room for us to view before Terry Mangum of Capitol Auction charmed bidders into taking them home. Wine and beer from Cristom Vineyard and Seven Brides Brewing Co. was served by volunteers Adam Miles and Jenny Gleason. Gleason plays cello in the orchestra. Dinner began with a short thank you from Keith Putman, the orchestra's board president, and a charming dance performance with a Cirque theme by young women from Starr Studios, Salem School of Dance. You can attend the next performance of the Salem Chamber Orchestra Seasonal Soiree . Piano Duets through Europe with Carole Orloff & Kristi Negri, at 4 p.m. Oct. 24. For more information, go to SalemChamberOrchestra.org. To someone with a penchant for musical instruments, a Zither plus fretboard has a mysterious, seductive appeal. 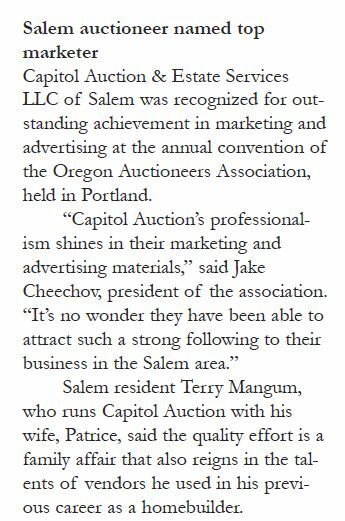 That's how Ben Wright of Salem found himself buying one with a top bid of $60 at the special music auction held by Capitol Auction & Estate Services on Saturday afternoon. "It's sort of like 'If you build it, they will come,' " Wright said, alluding the magical baseball diamond reference in Kevin Costner's "Field of Dreams." Wright has never before played one of the German-made instruments; he figures it will probably play like a harp. Much of the appealing pull to Wright is it's just so cool looking. 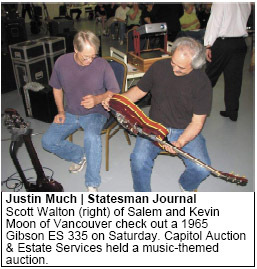 The Zither was one of the unique instruments at the music-themed auction, which included a rare 1965 Gibson ES 335 electric guitar, and a 1948 D-28 Martin acoustic guitar once owned by Stephen Stills - sold for $5,900. Auctioneer Terry Mangum said the Gibson is one of the top-5 rare guitars sought by collectors. Eric Clapton used a similar one, a 1964 model, when he played with the group Cream in the mid-1960s. It sold for $4,400. There were plenty of guitars on hand, and all items were there on consignment. Other items included vintage electronic tubes, a harmonica showcase (including six harmonicas), keyboards, one Mozart and one Beethoven bust, sheet music, vinyl records, a turntable and equipment that ranged from guitar strings and accessories to a rock 'n' roll mixer's control panel. "We hold an auction a month, and we normally do antiques and estate sales," Mangum said. "But we enjoy music, like a lot of people, and when the opportunity came up we decided we wanted to do a music auction." Between 60 and 70 were on hand and about as many online bidders from across the country. Many were first-time visitors to an auction. Mangum noted that some other guitars sold for more than a thousand dollars, and the 136-item total was more than $30,000. "We had a lot of people come up to us afterward who were interested in seeing more of these," Mangum said. "We are hoping we can do this on an annual basis, maybe even more frequently." Copyright © 2010 - StatesmanJournal.com All rights reserved.